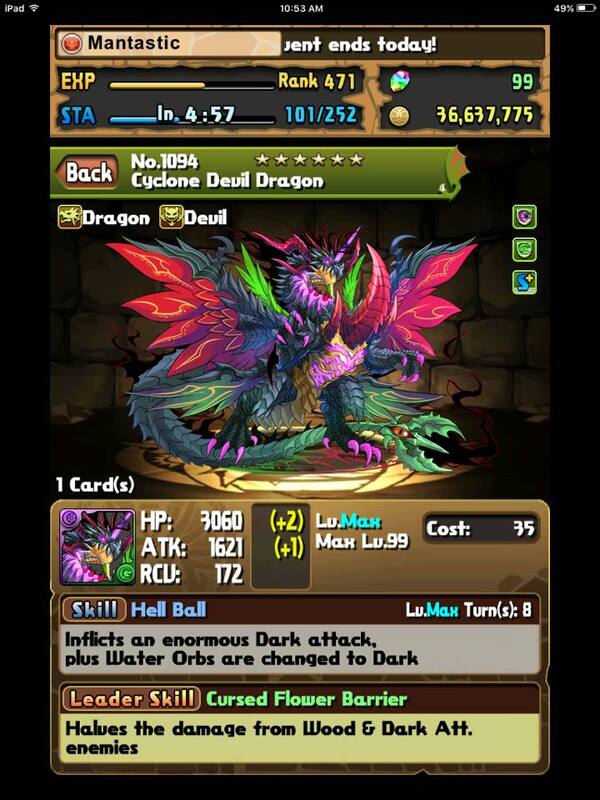 As the title implies, I want to provide a list of the best farmable monsters to acquire and where they can be found. 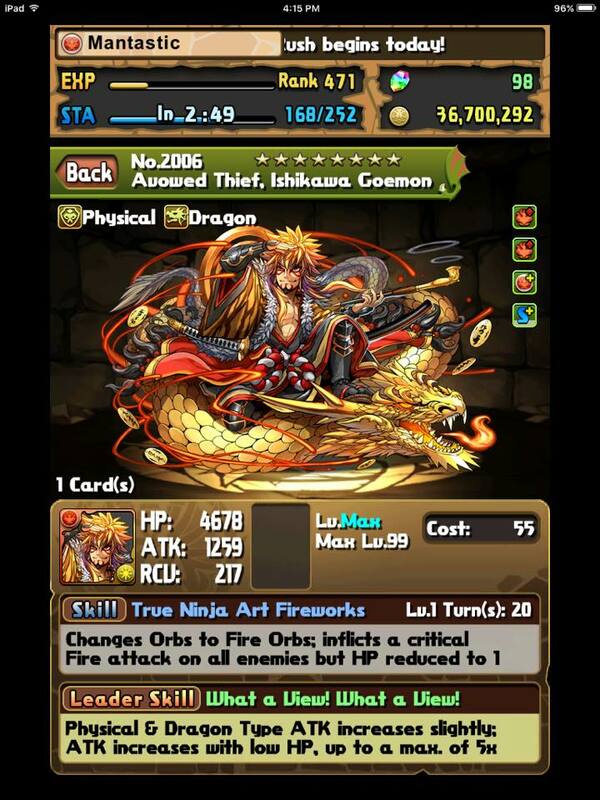 Currently, GungHo has been very generous with events, magic stones, etc. and a new account are able to push through content much faster due to more REM access, higher multiplier leads, and hypermaxed (best) friends. 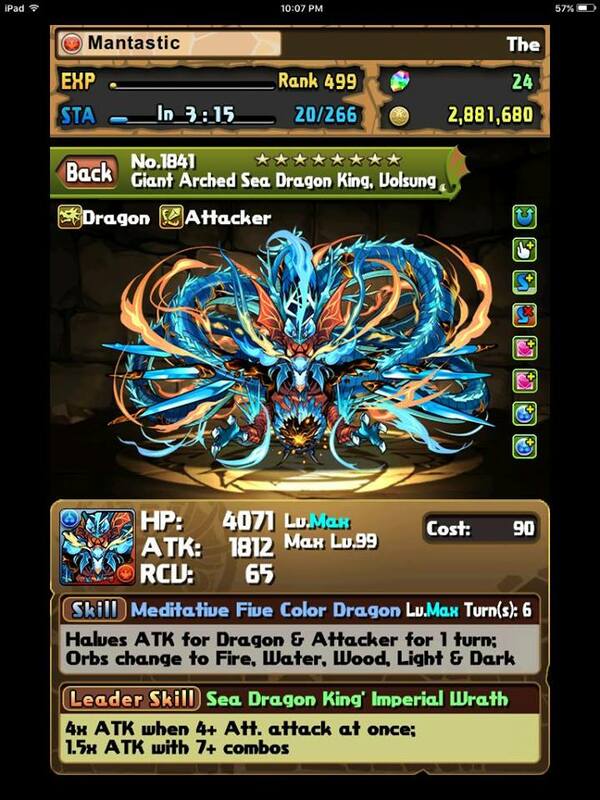 All of this adds up to a lower need to search out and acquire farmable monsters, but many have value to this day. From my own experience, I found Echidna , Valkyrie , Athena , Dark Izanami , Zaerog Infinity , and Satan to be the most helpful and still used to this day. Furthermore, I will try my best to keep this list up to date as new content is released. Uses and team roles: I wrote an in-depth guide to HERE, but she essentially has great recovery, a three turn delay, and fills the red slot on rainbow teams. Delays are starting to come back into style with more bosses having perseverance or resolve mechanics. By delaying the boss, you are able to circumnavigate their execution ability at 1% health. However, for beginning players, this delay could mean the difference between a successful 0-stone clear, or a painful death. Do not underestimate how Menacing can be. 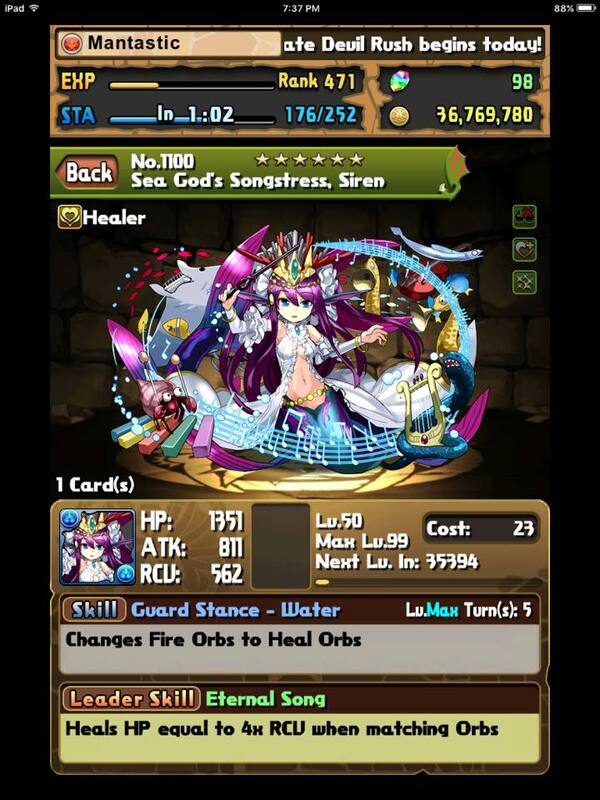 Best place to find: Athena Descended! is perhaps the most reliable place to acquire him as he perhaps drops 1/3 times and you would be replaying Athena for skill ups any way. He does drop throughout numerous normal dungeons, but I found this was the best way to get him reliably and also in his 4 star form. 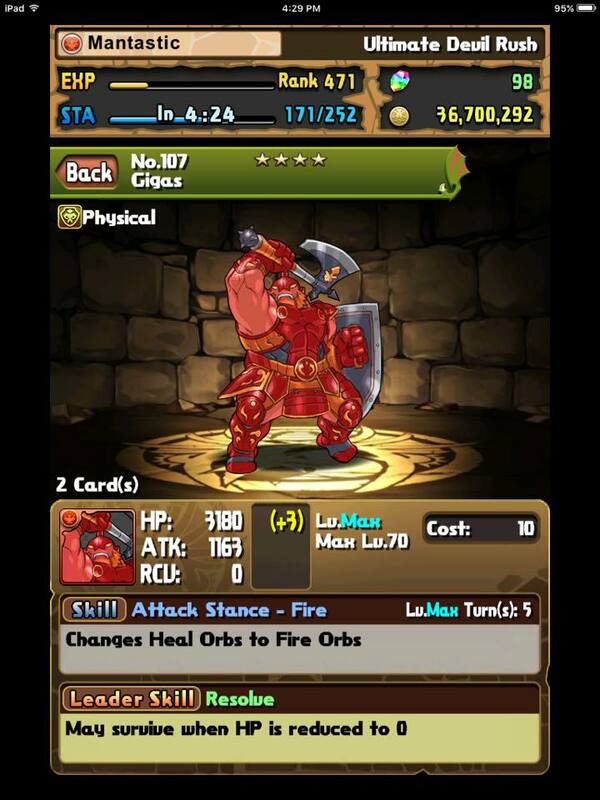 As a side note, his skill up fodder is found practically everywhere in the form of Samurai Goblins . Easy to acquire? Yes and he is also found in the pal egg machine along with being found in the normal dungeon, Tower of Giants (because he is so tall of course). Uses and team roles: With such a great name as he has, is only truly great as a low cost team sub for the horrible cost restricted descends. Having 1 or 2 at max skill is a massive health increase and provides a 5-turn orb changer. Of course you can always use in his evolved form as a mono red sub, but I feel his true power lies in the low cost realm. Best place to find: Seigfried can be easily obtained from his own dungeon, Hero’s Hideout, at a 50% drop rate OR from Athena Descended in his 5 star (second evolution) form. Best place to find: Siren has no exceptionally easy way to obtain per say; however, if I had to name a dungeon, it would be Blue Sky Dragon for 30 stamina in the Normal dungeon section. 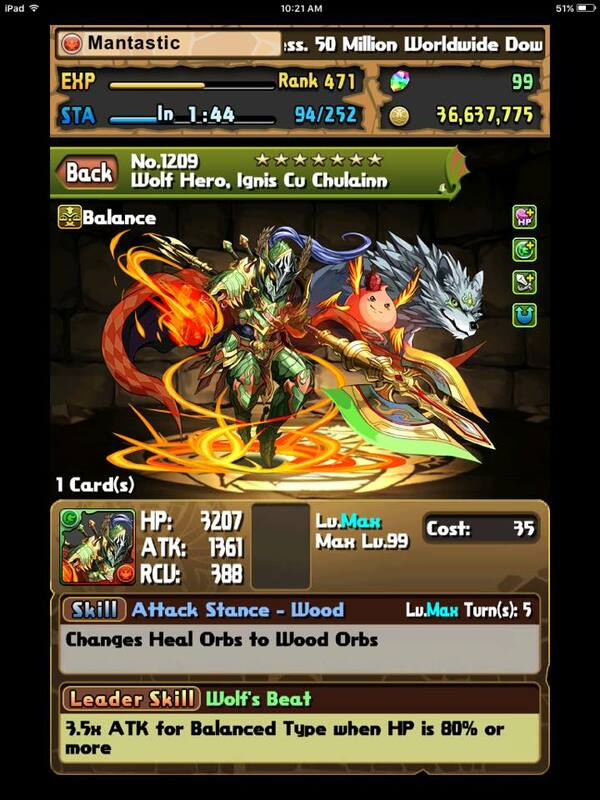 Best place to find: This Noble Wolf Hero can be easily obtained from his own dungeon, Hero’s Hideout, at a 50% drop rate OR from Athena Descended in his 5-star (second evolution) form. Uses and team roles: I call him Choo Choo for some strange reason, but could be mainly because of the previous naming released early on. Regardless, Cu Chulainn is an amazing mono green sub but only truly shines in his Green/Red form as this evolution unlocks the awakening which is immensely popular in mono green teams. The rapid access to green orbs combines with well balanced stats, makes for an excellent sub even along side REM options. 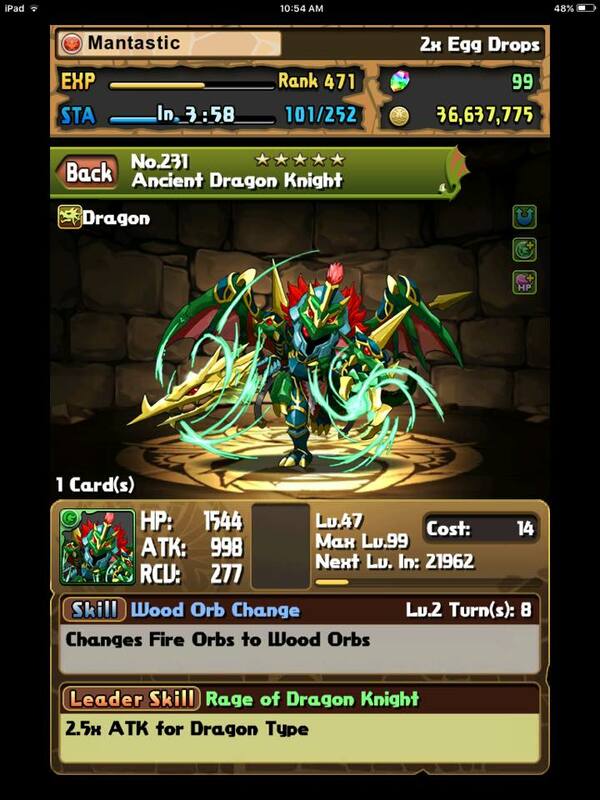 Best place to find: The green Mystic Knight can be most easily found in his own survey dungeon: Dragon Guardian. Easy to acquire? Yes! Like all the Mystic Knights, is found in more that just his survey dungeon and can also be obtained via the older pal machine. Uses and team roles: Once regarded as a strong 9x lead for dragons, has fallen out of favour simply due to time and powercreep. However, he is still a 5 turn orb changer of red to green which is a boon to all mono green teams as well as Umisachi Yamisachi teams (who do not use red orbs). Yes I know mine is not fully evolved, but I did have one a long time ago and fed him away for the pluses once I realized Sakuya was my dream team. Uses and team roles: functions as a fantastic 5 turn orb changer and removes those pesky dark orbs for Sakuya teams. 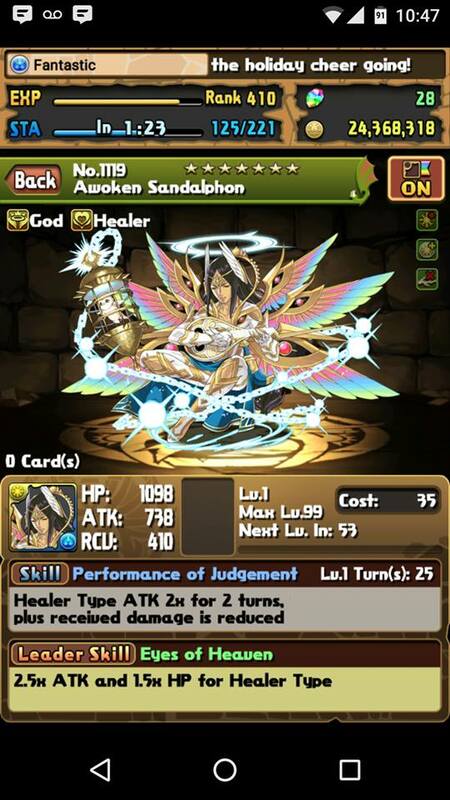 As a sub in mono light / god (Athena ) teams, acts as a quick and easy orb changer who also has a awakening. I used him extensively in my early days and still use him on my team to make runs go faster. Uses and team roles: has historically been valued for her ability to poison high defence monsters and effectively bypass their mechanic and instantly kill them. This still holds true and can be used to remove dangerous pii (coin dungeon, challenge 5), or high defense monsters in the various weekday dungeons. She also now has the benefit of providing a small 50% boost to devils for one turn and thus allowing her to double dip in her active usage. It is good to note her recovery is amazingly high for a devil and will provide a huge RCV value to any team. Lastly, you can use her poison to kill a boss with resolve (who does not have status shield). How easy to acquire? I am going to say easy? He will probably come out of the old pal machine as a little black dragon or randomly from a dungeon, just don’t throw him away! Uses and team roles: deserved mentioning because he is a farmable devil with an orb changer. Now, it may not seem that impressive to have a simple water to dark orb conversion at a max skill of 8 turns, but does synergize with Haku to produce a board 2/3 dark and 1/3 red. Even if you do not own a , can still provide an orb change for devil / dark teams. 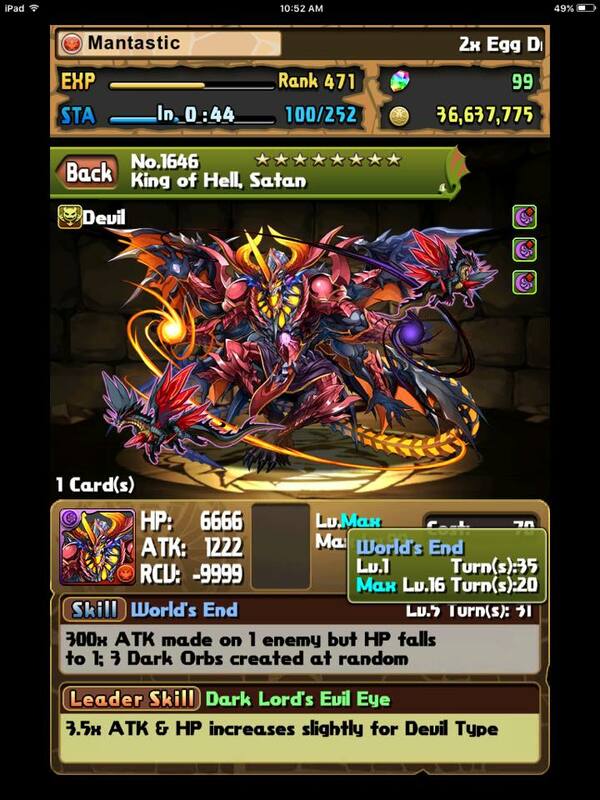 Even to this day, I still use him on my King of Gods Satan farming team. He used to have better hair…. 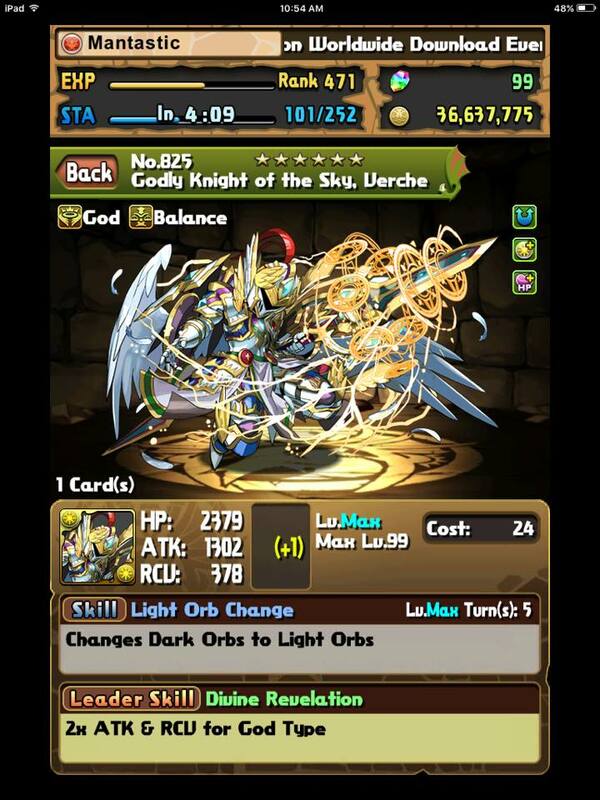 Uses and team roles: is the dark equivalent of Valkyrie with inferior awakenings and stats. 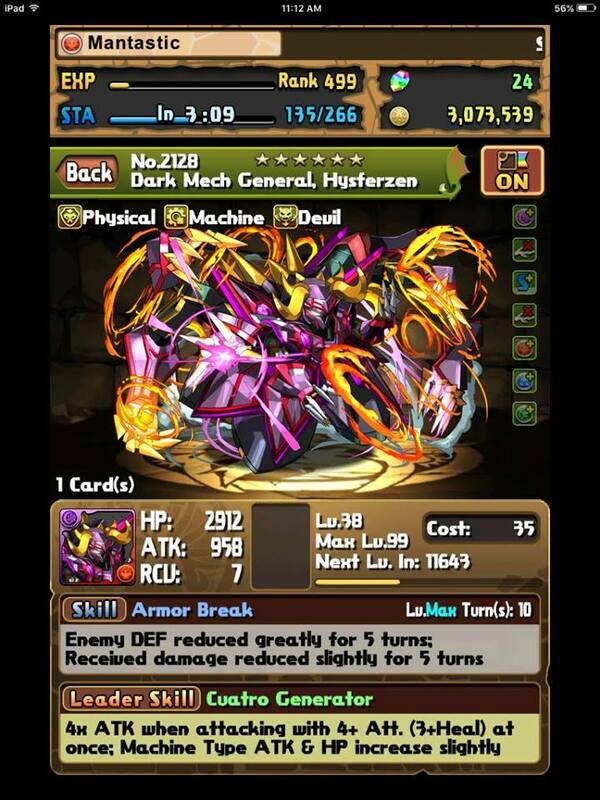 has an amazingly powerful 5 turn heart to dark orb change which is easy to skill up. The biggest drawback compared to is he only comes with 3 awakenings. But nevertheless, can play a central role in dark based teams as the quick access to dark orbs can allow you to pump out constant damage. He also has quite balanced stats and a large amount of recovery for devils. Uses and team roles: and are able to break enemy’s defences by 75% along with providing a 20% damage reduction for 5 turns. This armour break is particularly valuable when facing high defence monsters as you will be able to kill the floor with relative ease and the armour break carries forward to the next floor if you sweep your current one. When fully evolved (which is resource intensive), they create 25x damage machine teams (16x for regular monsters) as well as a modest health boost. They seem appealing on paper, but the sheer number of evolution materials required to evolve them would probably mean you have a stronger option already. You are the dancing queen…. Uses and team roles: Many high ranking players who are solely interested in speed farming use as a lead due to the “press one active, kill floor” play style. The teams can vary in sub choices, but the overwhelming trend is to have many skill boosts to use as little time as possible per floor. Do keep in mind that this team allows you to clear dungeons very quick, but you are still using the same amount of stamina and thus to truly benefit, you have to be willing to refill your stamina repeatedly. Easy to acquire? Yes! 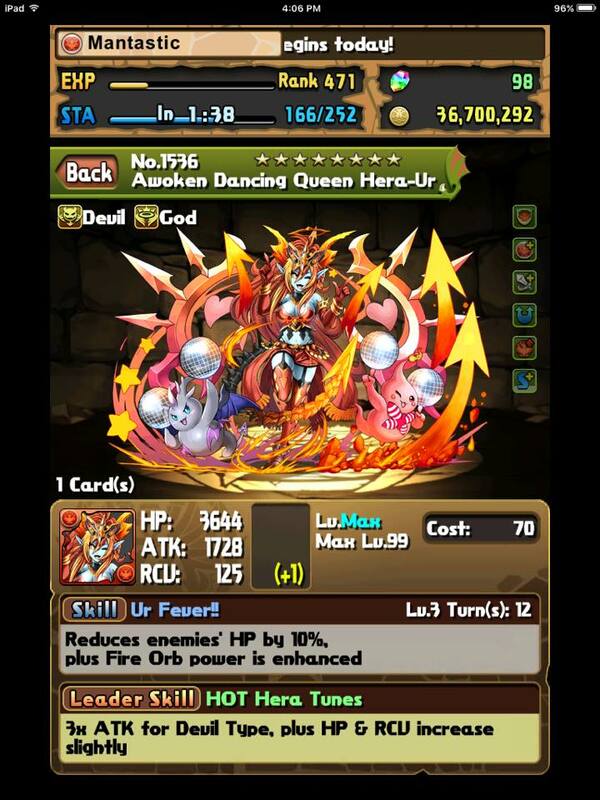 Hera-Is is certainly one of the more easily obtainable monsters from descends and I personally place her on my 7 Descend Hit List for what beginners should aim for! Also, here is my step by step GUIDE to clearing her descend. 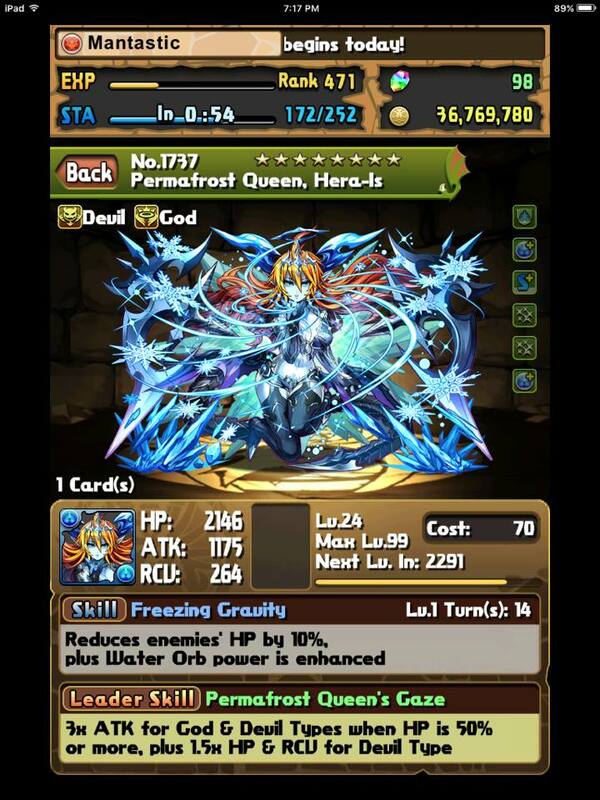 Uses and team roles: Hera-Is was at one point a top tier sub in her Blue/Dark form as she filled two awkward colours on rainbow teams and gravities reigned supreme. Fast forward to today, her role as a gravity is less vital; however, with the inclusion of perseverance as a boss mechanic, her active can allow a safe kill as you can use gravity to push the boss out of their perseverance range, then match orbs to kill. In her Blue/Blue (and prettier form) she fills the role of a mono blue enhancer should you not have a suitable REM replacement. She is able to be skilled up via the Summer Pad Event and probably need to wait a while to have access again. Uses and team roles: Eye Candy aside, Valkyrie fills the green slot on rainbow teams as well as being a powerhouse on the light primary rainbow teams. The fact she can be skilled up to 5 turns as well as providing the main damage orb makes her almost irreplaceable. Perhaps I am biased as she was my second hyper max and has an almost guaranteed spot on my Sakuya and Light Kali teams. 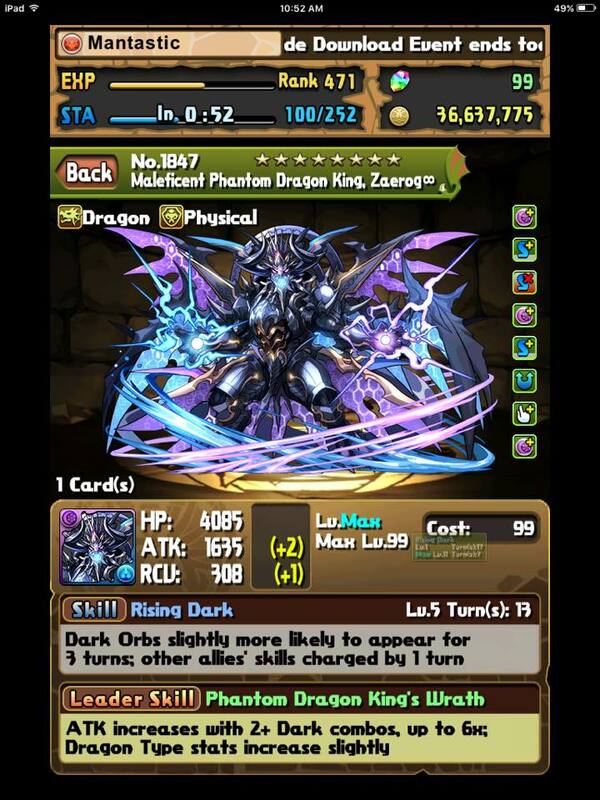 Awakenings are quite strong for a farmable monster as the two prong attack and double light orb enhance awakenings pushes your damage when combined with at least 3 other awakenings because it guarentees all light orbs will spawn with a plus and adds +50% more damage for all light monsters. 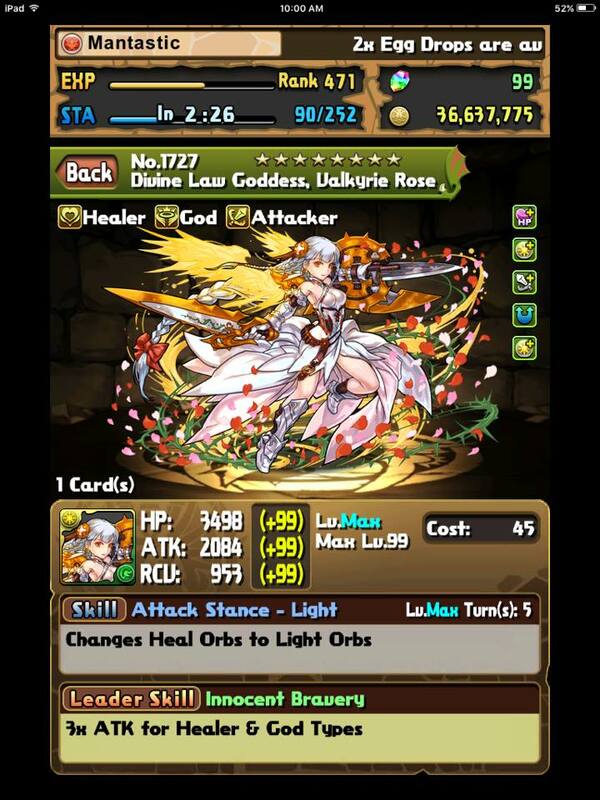 I could probably ramble on more about my love for Valkyrie, but I should restrain and make her own post at a later date =) TLDR, if you own a rainbow or light team get her! Uses and team roles: Athena makes a fantastic farming lead as she provides an unconditional 9x damage multiplier along with a modest hp buff for god types. Simply match a yellow two prong attack and BOOM! easy floor sweep. Her active is okay as the enhance does add damage, but it is quite dependent on how many light orbs your board has and needs to be comboed with an orb changer. However; can also provide the role of an offensive powerhouse on rainbow teams. In addition, her 2 awakenings allow to burst incredibly high and is able to pierce through high defence monsters with ease. Furthermore, her 2 blind resist awakenings means she provides 40% protection all on her own. Lastly, she can fill the green slot on rainbow teams. I am pretty biased towards her as I do find her power to be fantastic and is one of my hypermaxes. How easy to acquire? Her Descend is modestly challenging and I did write a very in-depth guide HERE. Once you are able to clear the descend, it may take a few clears to actually get her to drop. 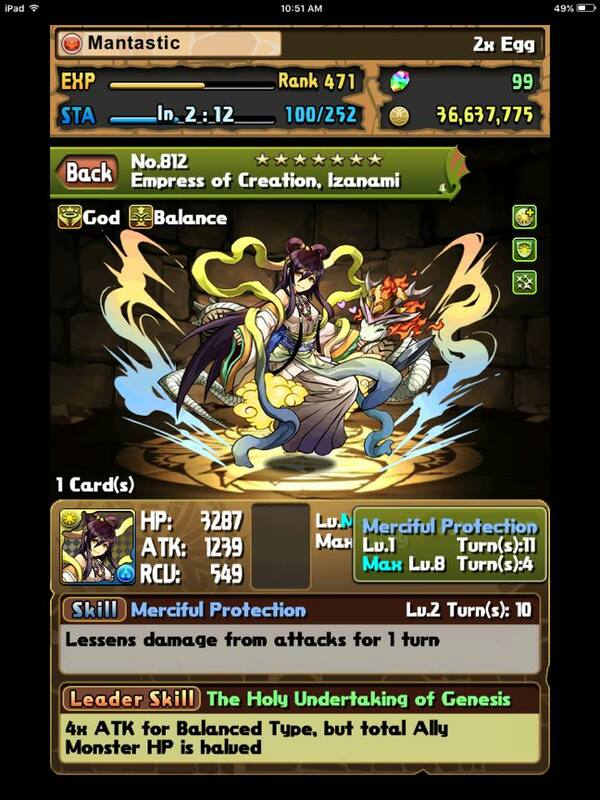 Uses and team roles: Light Izanami is less powerful than her dark cousin as the shield only lasts 1 turn compared to 3 and is harder to skill up. I am only wanting to bring attention to because she is more “on” colour for many light rainbow teams and can fulfil the blue slot as well. Her stats are quite well balanced and her active, if you can make use of it, is powerful way to avoid a killing blow or large preemptives. Easy to acquire? With the restriction of No Duplicate dungeons changed to only affect subs, this descend has become significantly easier as you can bring a matching leader instead of trying to be creative with new team compositions. Just note you should not be using a dark team. Uses and team roles: functions as a powerful healer enhancer with an active that increases healer type damage by 2x for 2 turns along with providing a 35% damage reduction shield. 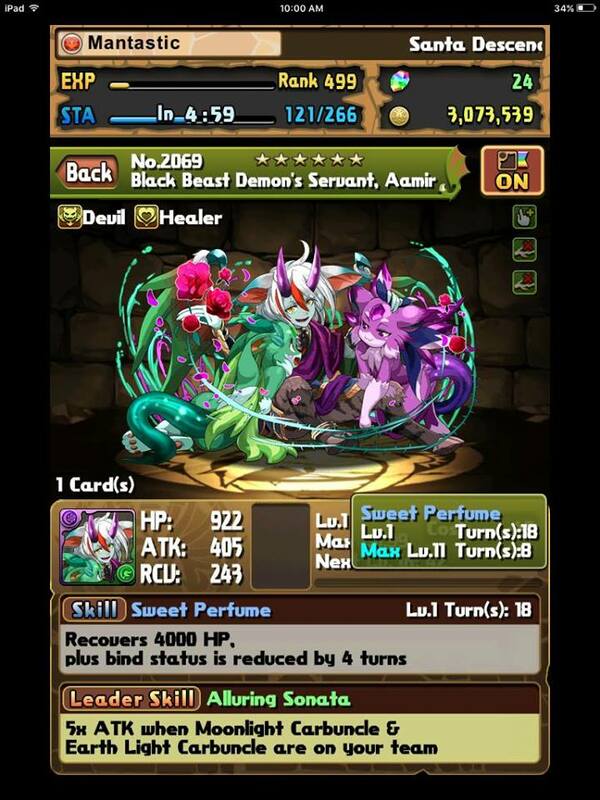 In addition, her base stats are quite high for a farmable monster with no ultimate evolution. Furthermore, by providing 1 light orb enhance and 1 light row awakening, you are granted some passive damage every turn. She just wants a hug! How easy to acquire? Her Descend is modestly challenging and I did write a very in-depth guide HERE. 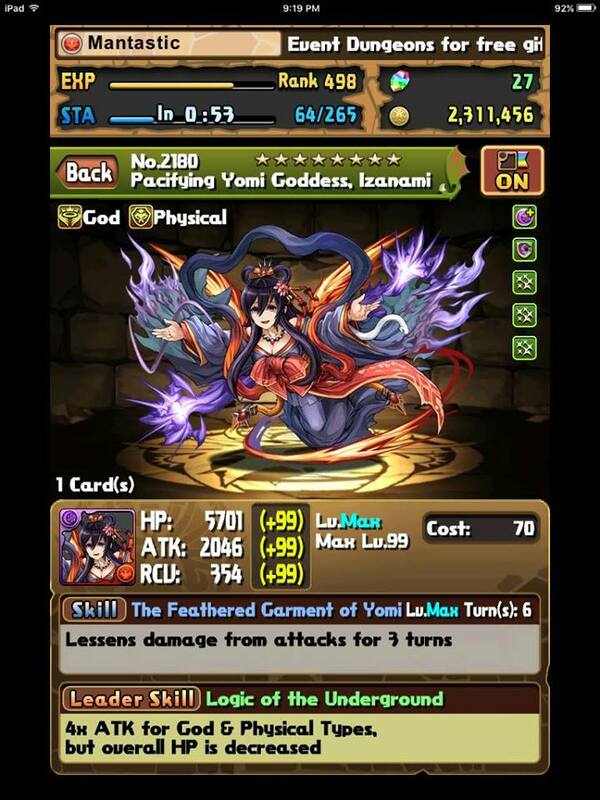 Uses and team roles: Dark Izanami is regarded as one of the best subs in the game due the advent of haste on dark teams. provides a 35% damage reduction shield lasting 3 turns on a 6-turn cooldown. When using haste actives, you are able to potentially chain her active repeatedly and thus have a permanent 35% damage reduction shield. In addition, she provides 1,500 worth of auto healing through her 3 awakenings. Furthermore, her large health pool can allow you to survive significantly more painful attacks even without the use of a shield. Best place to find: Aamir can be found in his own descend Hedonistic Demon in both mythical and legendary difficulty. Easy to acquire? His descend is modestly challenging and does require some forethought and planning to ensure you can survive his 2 turns of damage absorption. Uses and team roles: deserves special mentioning as a farmable bind-immune bind clearer. You are most likely only going to use his active once per descend and the 18 turns may be manageable if you can stall on the earlier floors. The additional time extend awakening is a nice added bonus and gives dark teams an option for immediate bind removal. Easy to acquire? 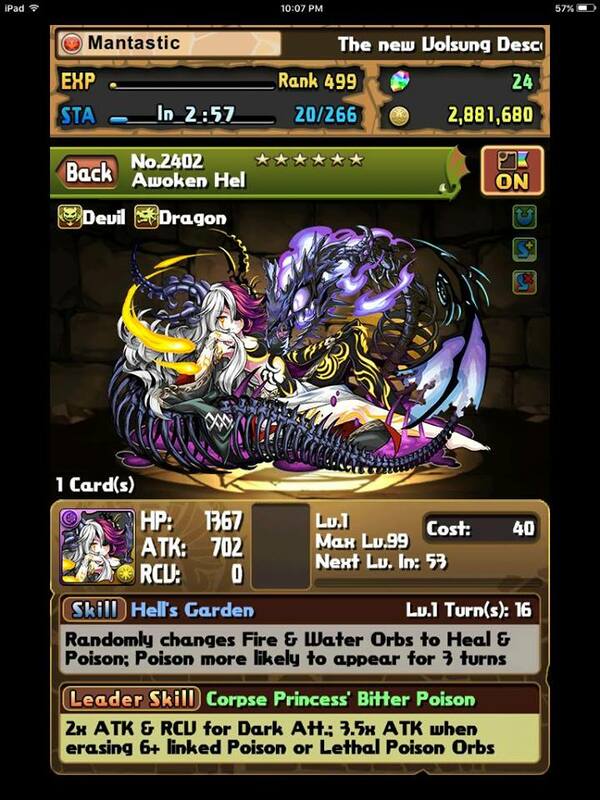 No as Princess of Darkness is quite the challenging descend as the final boss has 6.8 million health on mythical. 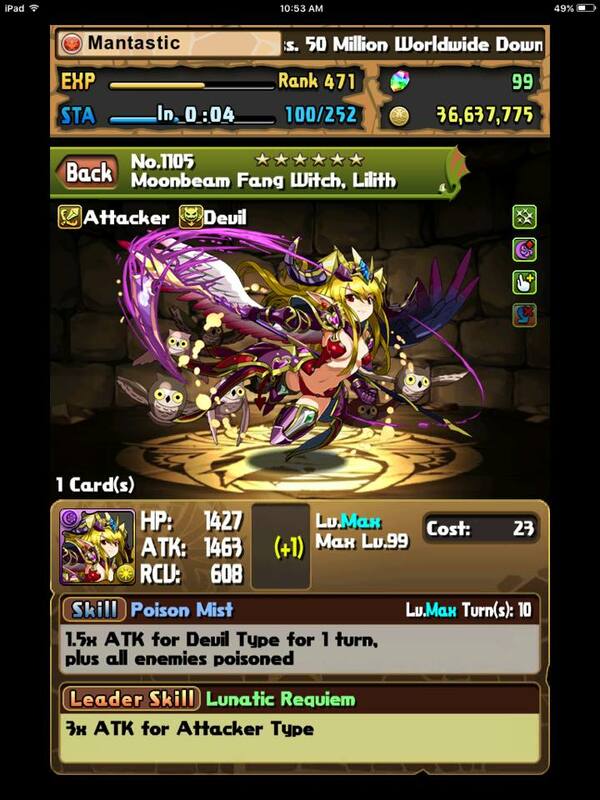 Uses and team roles: is quite the unique monster and deserves special mentioning as she is capable of forming a 49x damage lead with 4x recovery. However, you must match 6 connected poison orbs to trigger your full multiplier. This unique playstyle offers a new challenge as you must simultaneously manage your health, poison orbs, and dark orbs to deal damage. is able to be max skilled to a 6-turn cooldown and between the 2 leads, you should be able to chain skyfall actives. Fun to play, but challenging to master is perhaps the best way to summarize . World’s End isnt that Scary…. Best place to find: Satan drops from his own Descend at 100% chance on the single difficulty level. How easy to acquire? He is on my 7 descend hit list found in my New Player’s Guide and his dungeon’s main hurdle is overcoming 6.66 million HP (which is crazy high for an old dungeon) but the difficulty is offset/enhanced by no heart orbs spawning. Uses and team roles: I use Satan as a speed farming dark row, devil based team and most notably for King of Gods Farming. provides an amazing health pool, but you are unable to actually heal any health when matching heart orbs (can still heal via awakenings and actives). This makes his gameplay different as you have to find a balance between stalling and sweeping the floors. Luckily, there are many dark devils available and his triple row enhance can wreck modest bosses when speed farming. 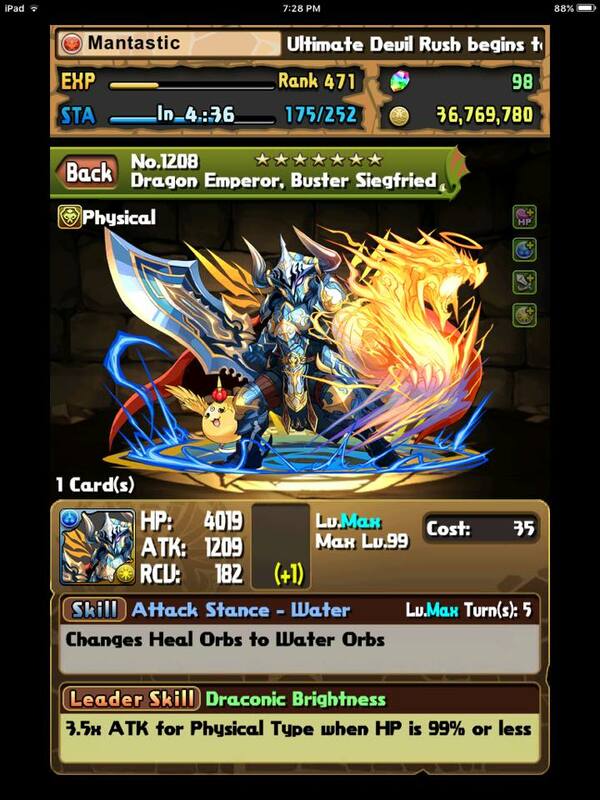 I pair with a Lu Bu to bring myself to ~40k hp and many row enhance awakenings. How easy to acquire? I would place Fiend Prince in the middle in terms of descend difficulty as it is relatively straight forward and numerous actives can hard counter the dungeon mechanics. With that being said, it may be best to wait until you develop your teams more or complete other descends. Uses and team roles: The crazed motorcycle riding demon acts as a powerful leader especially when paired with Red Sonia as he provides a large HP boost along with a strong damage multiplier. ‘s awakenings are sadly TPA based and that goes against the norm of devils being row based . However, ‘s leader skill is still powerful. 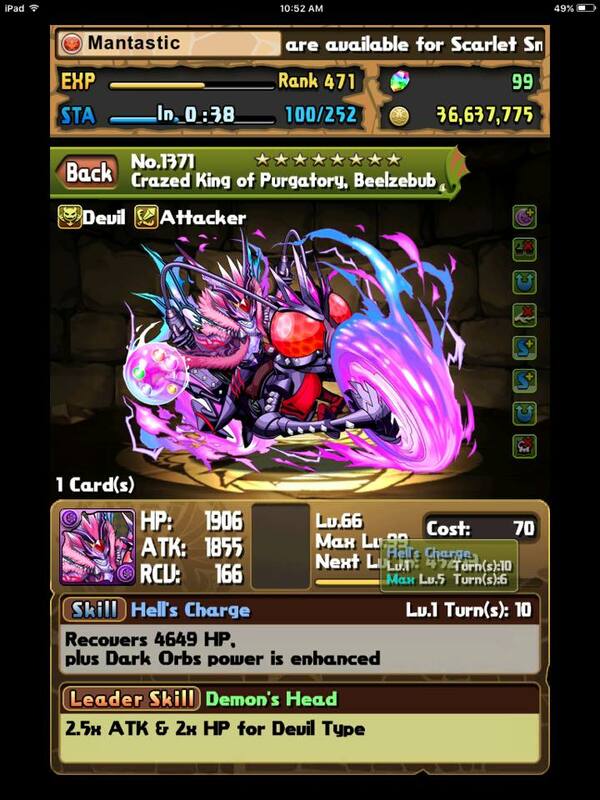 One neat trick I have learnt while farming King of Gods is that you can use Lu Bu twice (floor 9 and 10) as Beelzebub provides a heal to push your health above 1 in order to use the second Lu Bu for the 10th floor. 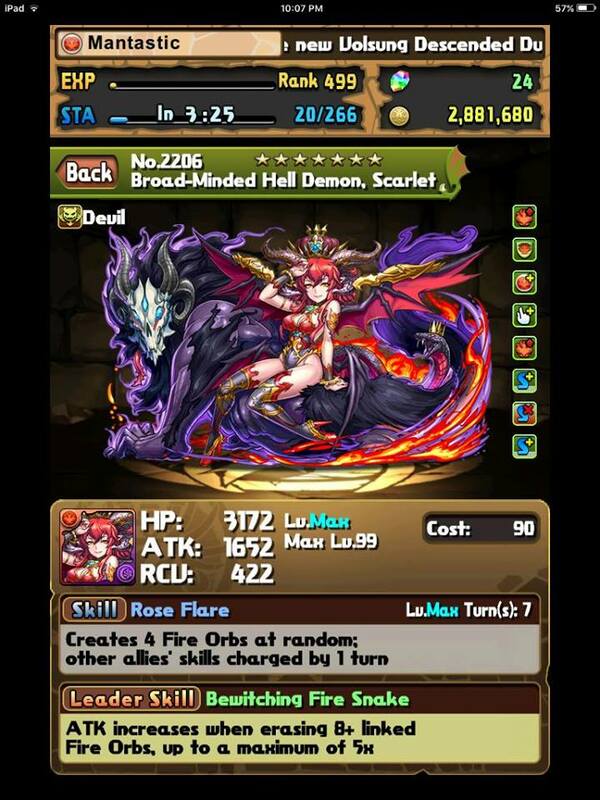 Best place to find: Scarlet is a guaranteed drop from Scarlet Descended! Easy to acquire? ‘s descends is probably the hardest dungeon to date as it is very unforgiving and your monsters will not level up much due to less floors and no trash mobs. Any mistake is quickly punished by a swift death and clearing, let alone skill her up is a task for only the most veteran players. Uses and team roles: can function as either a mono red lead or sub that places emphasis on fire row enhances. Furthermore, you can combine her haste mechanic with other skilled up haste monsters to create a “system.” A system is a type of team that can repeatedly chain actives on every floor due to the bountiful haste abilities and low base cooldown. A luxury team consisting of only max skilled s can in theory use multiple actives every floor and this is referred to as a Scarlet System. Regardless, she can form a 25x multiplier team when matching 10 connected fire orbs. We are still waiting for a stronger row-based red team, but once we have that leader, will be a wonderful sub. 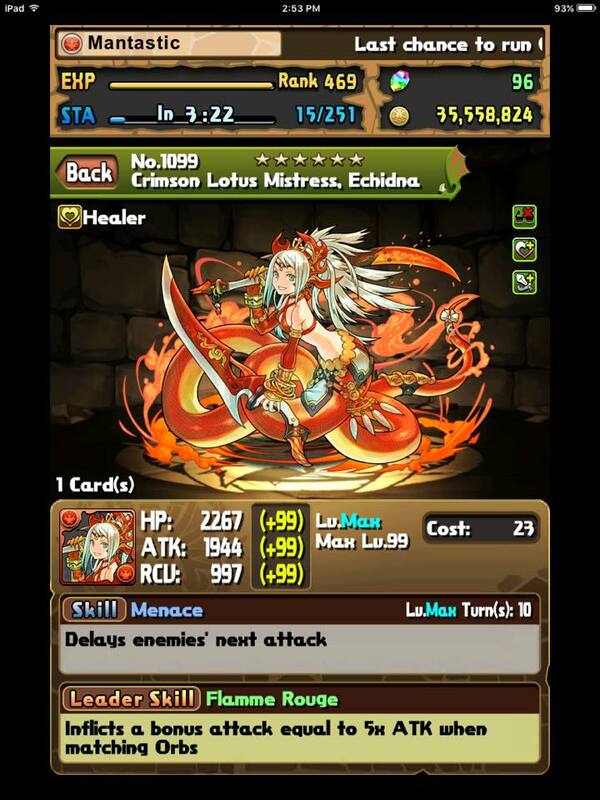 Uses and team roles: has an impressive 8 awakenings along with the coveted Light Kali style board refresh. Granted, does reduce dragon and attacker type monsters by 50% for 1 turn, but that is the price you have to pay for one of the most powerful actives in the game. As a lead, he forms a 36x damage dealing rainbow team, but that is sadly not strong enough in today’s meta, and you probably used a stronger team to clear his descend too. Further reading on my impressions of can be found HERE. Easy to acquire? No! At the time of his release, he was the most challenging descend to date. However, over the past few months, we have gained access to more awoken evolutions and thus making it a bit more manageable. Lastly, the descend gatekeeps newer players as plus eggs have more benefit because they provide their full value regardless of your monster’s levels. Uses and team roles: Aside from the pure trophy aspect, is a top tier lead and sub once max-skilled. However, farming for skill ups can be quite challenging as the dungeon is difficult to clear and requires 10 successful skill ups. The power of enhanced skyfalls, enhanced dark orbs , and haste result in a fantastic active overall. Some mono dark or combo teams may like to have 2 max skilled to have a permanent skyfall buff, but that alone is an obscene investment. If you have the capacity to clear and skill him up, will become a dream monster to have. 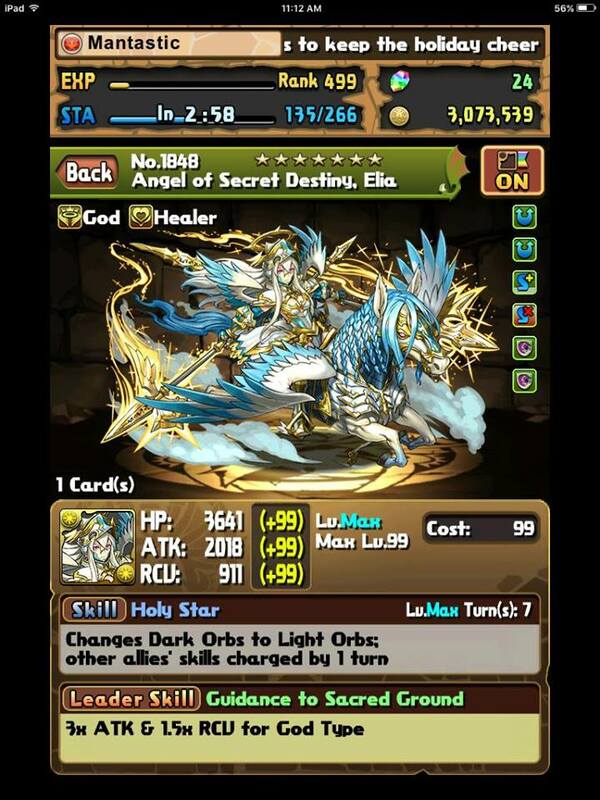 Best place to find: Elia is a rare invade in descends during the Angels of Fate Event. Easy to acquire? is perhaps the hardest monster to acquire, let alone skill up as she is a very rare spawn and requires 15 successful skill ups to max skill. Uses and team roles: ‘s shining role as a sub is on Awoken Sakuya teams as you can remove the unneeded dark orbs as well as providing 1 turn of haste. In addition, can be used on mono-light teams, healer teams, and god based teams as a powerful orb changer and hard hitting monster with 2 two prong attack awakenings. 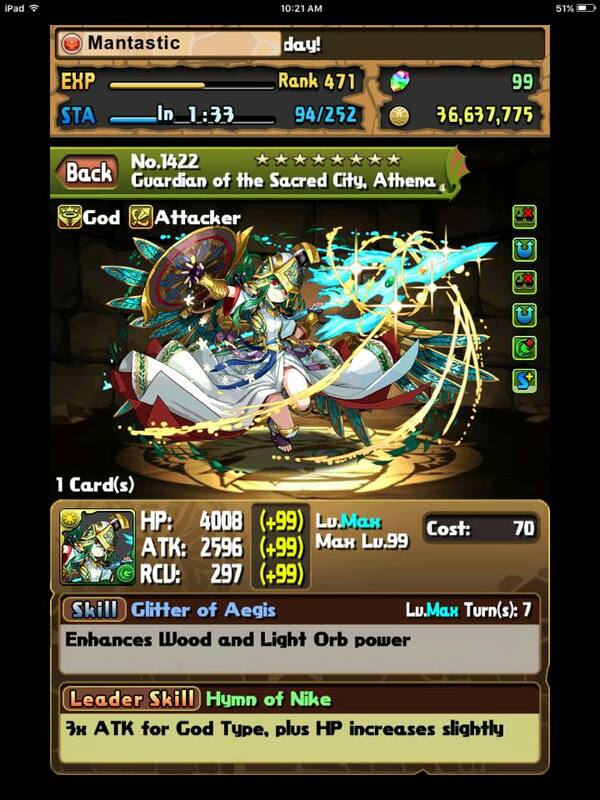 As a lead, she can pair with Athena to provide a tanky and hard hitting light god team. However, requires an obscene amount of resources to max skill and is out of reach for the majority of players. If you feel I have overlooked certain strengths or missed your favourite farmable monster, please leave a comment below and I will make changes as needed. In addition, I will try to keep this page updated as we acquire more farmable options for our favourite teams.